Cisternino is set on a plateau about 400 metres above sea level chosen for its defensive position from as far back as Neolithic times. The land falls away and is covered with vineyards, fruit trees and olive groves which is where you’ll find our villa. You can enjoy the best of both worlds, a calm rural setting and the proximity of a charming nearby town to explore.Cisternino is set on a plateau about 400 metres above sea level chosen for its defensive position from as far back as Neolithic times. The land falls away and is covered with vineyards, fruit trees and olive groves which is where you’ll find our villa. You can enjoy the best of both worlds, a calm rural setting and the proximity of a charming nearby town to explore. 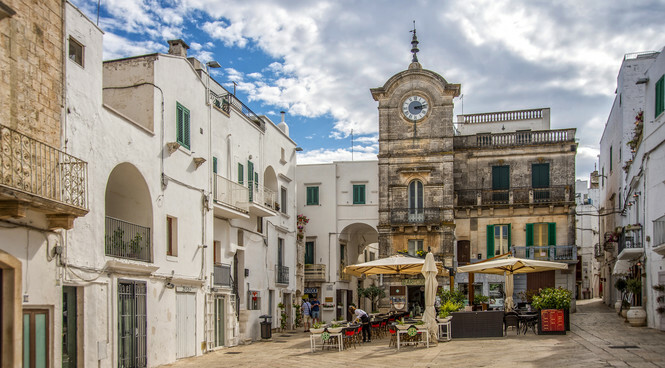 In the centre of Cisternino, you’ll find a number of smarter boutiques and small galleries plus a chocolatier in the main piazza near the clock tower. The weekly market takes place on Monday and you’ll find locally produced goods for sale along with clothes, shoes and homeware. On the outskirts, there is a supermarket to stock up your villa for a relaxing stay. You can start your evening with an aperitivo in the piazza by the clock tower. In the same area of the town, there are plenty of butchers’ shops which run a lucrative side line by becoming restaurants each evening, known as arrosteria. Simply choose from the large selection of different types of meat and it will be and it will be taken away and grilled over a wood fire for you. 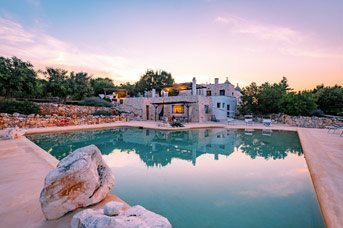 The coast is around 30 minutes’ drive away and you can choose between simple coves with limited facilities and a private beach club like The White Beach Club at Ostuni where sunbeds are available for hire and there is an onsite restaurant. There are beaches in and around the seaside towns of Monopoli and Polignano a Mare so you could combine swimming, sunbathing and sightseeing. Fasanolandia is a theme park and zoo around 30 minutes’ drive from Cisternino with over 200 species of animals and a selection of rides for all the family. The Grotte di Castellana, a 2 mile network of underground caves where you can take a guided tour is about 40 minutes’ drive from the town. Acquapark Egnazia is a popular water park with slides and pool as well as sunbathing areas. There are a number of churches in the town centre plus plenty of streets and piazzas to roam around and find interesting boutiques, stopping for a coffee or a relaxed lunch by the clocktower. The nearby towns of Locorotondo, Ostuni and Alberobello are all worth visiting. For a full day out, the Baroque town of Lecce is well worth the 1½ hour drive to see the Basilica and Santa Croce Church. It has an excellent reputation for its food so make sure you have lunch at one of the many restaurants.